Scotch Plains is a township in south western Union County. It is home to nearly 24,000 people. There are currently 168 homes offered for sale in Scotch Plains, ranging in price from $184,995 to $1,888,000 – something for every budget. Twenty homes were sold in October, slightly lower than the 12 month average of 28 homes. 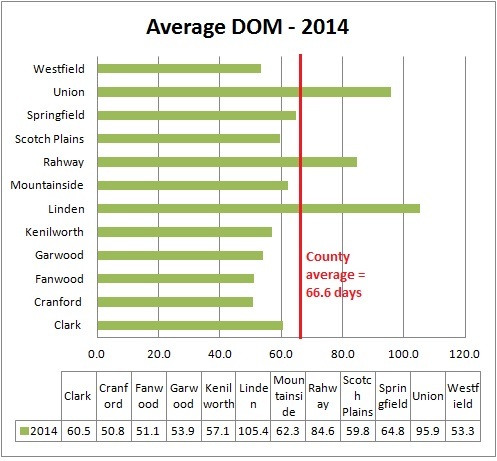 Homes in Scotch Plains were sold in October after an average of 63 days on the market. The average sale price was $610,389, significantly higher than the 12 month average of $512997. Before you buy or sell a home in Scotch Plains, your first step is to understand how the real estate market is performing. Here’s what you need to know this summer. Inventory: There are currently 176 homes offered for sale in Scotch Plains. 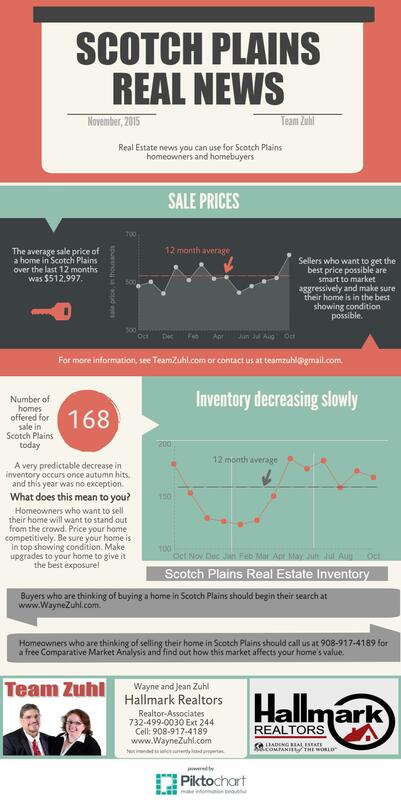 This is pretty normal for Scotch Plains – you can see in the graph below that every sumer has a peak inventory of roughly 175 homes. The summer market is definitiely heating up. Prices: The average price of a sold home in Scotch Plains in June was $472,235. This is 8% higher than June of 2014 when the average sale price was $439030 but 8% lower than the 12 month average of $508,310. What’s happening? There’s a definite up-trend over the past year as the real estate market continues to settle, and you’ll notice that the peaks and valleys are less extreme now than they were three years ago. Sellers who want to get top dollar for their home will want to be sure that their marketing is on point and that their home is appropriately priced. Buyers who are looking for a bargain in Scotch Plains will want to do their research. When you find the home you want to buy, be sure that your offer is competitive because there are many multiple offer situations this summer. 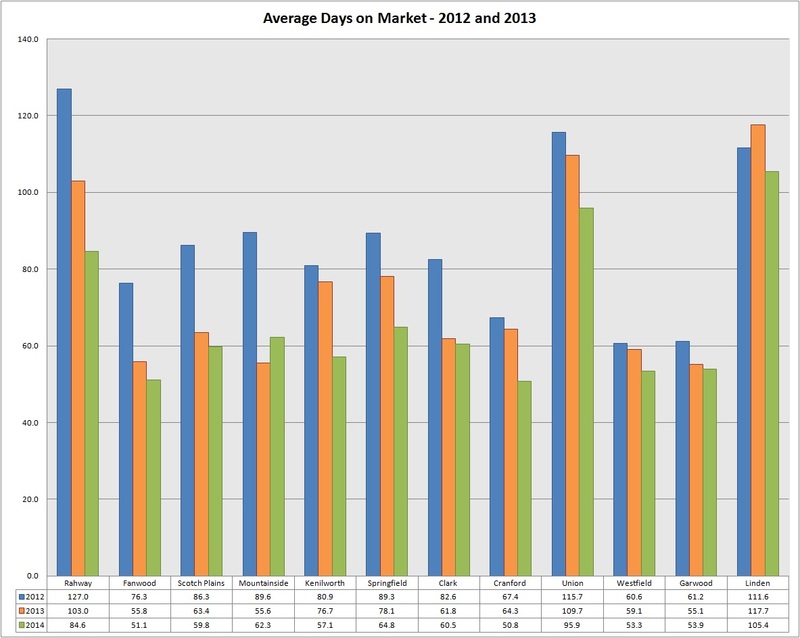 Days on Market: The average sold hom in Scotch Plains was sold after 56 days on the market. Looking at this graph of the past 3 years, it’s easy to see that things have improved quite dramatically although there are still some bumps in the road. But don’t think for even one moment that Scotch Plains’s real estate market is dead in the winter! This winter, Scotch Plains had 125 active listings and 118 sold listings. The average sale price this winter was $551,616 with the average home selling 71 days. Significantly more homes were sold this winter (118) compared to last winter (36). Inventory is slightly higher this year (125 listings) than last year (111). The average sale price in the first quarter of 2015 was $551,616 compared with an average sale price of $452,714 last year. The average home sold after 71 days this winter compared to 65 days in 2014.